Starring Franchot Tone, Ella Raines, Alan Curtis, Aurora Miranda, Thomas Gomez, Fay Helm, Elisha Cook Jr. Directed by Robert Siodmak. (1944/87 min). Who says you can't find good help these days? Unhappily married engineer Scott Henderson has a fight with his wife and goes to a bar to drown his sorrows, where he meets a mysterious woman. She seems morbidly depressed, too, so he suggests they attend a show he has tickets for. She agrees, so long as they remain anonymous. Afterwards, Scott drops her back off at the bar and goes home, only to find the police there. It turns out his wife was murdered –– strangled by one of his own neckties –– and he's their number one suspect. Since his only alibi is a woman whose name he doesn't know and can't locate, Inspector Burgess (Thomas Gomez) has a hard time believing his story, especially since potential witnesses –– the bartender, the concert musicians and the cab driver –– claim they never saw Scott with a woman that night. He's convicted and sentenced to death, but his dedicated secretary, Carol (Ella Raines), is convinced of his innocence. With 18 days left until he's executed, she goes out on her own to find this mysterious woman and clear his name. 'Man, talk about your dedicated employees! Carol spends several evenings browbeating the bartender into submission. When she finally confronts him, he runs into the street and gets pancaked by a car. She later seduces one of the concert musicians into drunkenly admitting he was paid to lie to the cops. A show dancer's custom headwear –– apparently identical to the woman's –– puts Carol on the search for the hat-maker, who hopefully might provide a name. If you ask me, that level of dedication makes Carol a shoo-on for Employee of the Month. Well, she is secretly in love with Scott, which I suppose is good motivation. She eventually gets help from Burgess and, almost too conveniently, Jack Marlow (Franchot Tone), a friend of Scott's who later flies into town upon hearing about his conviction. 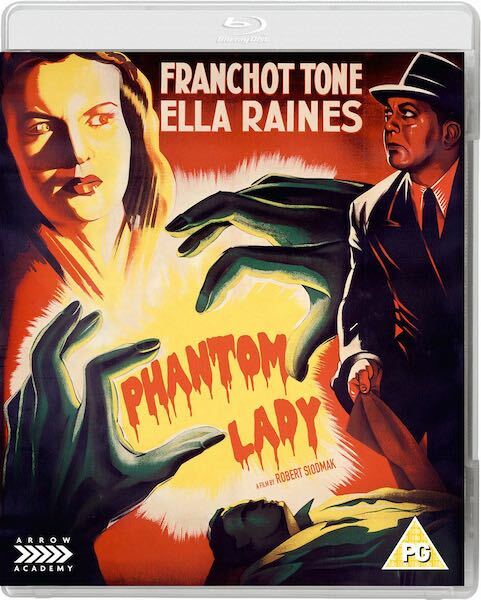 A minor and obscure entry in the film noir genre, Phantom Lady doesn't rank among the classics, but is enjoyable on its own terms. The plot doesn't bear a lot of scrutiny and most viewers will have this mystery solved at about the halfway mark. There's some clunky dialogue and a few performances are a bit chuckleworthy (such as Elisha Cook Jr's sweaty, manic turn as an overly enthusiastic drummer). Still, this quick & dirty crime caper moves along at a brisk enough pace that we don't question most of the story implausibilities until it's over. Despite the billing order, Raines is the real star of the film and she's quite engaging. Having just recently revisited Key Largo, I'd also forgotten what a fine character actor Gomez was. His congenial performance in this one was a pleasant surprise. So while we ain't talking Hitchcock or Huston here, Phantom Lady is a competently assembled piece of minor league film noir. It's no classic, nor does anything about it doesn't resonate much afterwards, but certainly entertaining in the moment... and perhaps a perfect secretarial training film.